#162) CDC’s Zombie Apocalypse Rolls On! A DEADLY SERIOUS TOPIC FOR THIS HALLOWEEN. 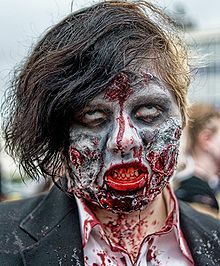 The CDC’s Zombie Preparedness Campaign may sound like a bunch of silliness, but in truth it’s as serious as the deadliest infectious diseases they study. This Halloween they are releasing a graphic novel about zombies and disaster preparation. Disaster preparedness is a difficult mission and deserving of resorting to any means necessary to make it happen — even if you have to stoop to employing a topic that makes other people think you’re just having fun. The folks behind this campaign are not doing it for fun. I know. I’ve spoken to them. It’s A LOT of work. But worth it. This is another installment in our on-going observations of “Communication Brilliance In-progress.” I’ve written twice about the savvy of the small group at the Centers for Disease Control in Atlanta (here and here) who managed to take a topic that had become deeply institutionally entrenched as “hopelessly dull” (with the prevailing attitude of “you can’t get people motivated about a threat that isn’t present”) and through a little creativity and courage have converted $87 of effort into $3.4 million of free media exposure. The juggernaut rolls on this morning with USAToday running a feature article on their front page about the next item in the campaign, a graphic novel for Halloween. Look at how good these people are. They only came up with the entire idea for this campaign in May. But no sooner did they conceive it than they moved it to the next level with appearances at Comic-con in NYC and Dragon Con in Atlanta. And now, in less than six months from inception have put together a graphic novel. They are hustling! This is a true 99% total success. Not 100%. That would pretty much be impossible given the way the human brain is programmed. You just can’t please 100% of the people. Rarely has there ever been such an enormous public health mass communication success as this campaign (just look at the value/spending ratio of 3.4 million to 87, plus it won the prestigious Wow Innovation Award at the Platinum P.R. Awards), and yet … here’s a person I found commenting on a blog who hates them for having a little fun while others are suffering. “I am so glad the CDC has its priorities straight. God knows being sure people are prepared for the ZOMBIE APOCALYPSE is more important than those of us who are sick and dying from M.E. (Myalgic Encepahlomyelitis). After all, we were just active and productive citizens adding our contributions to our nation and the world until we were struck down by this horrible disease. What are death and disease compared with BEING FUNNY? But “fun” is not what this campaign is about for the creators — it’s about using pre-existing pathways of mass communication to reach effectively the largest audience possible. And in that regard, this program is as deadly serious as the worst infectious diseases, which CDC spends the rest of their time combating. To give them flak for having “fun” is like accusing a disaster relief team headed to Jamaica after a deadly hurricane of heading off on a tropical vacation. Same thing.